Alderney is the third largest Channel Island, and is the nearest to both Britain and France. Yet for years it has been curiously tricky and expensive to reach, and as a result it has for a long time been the one Channel Island I've not visited. I wanted to put that right during my stay in Guernsey, and luckily I managed to book with Bumblee, a boat service that is only in its third year of operation but provides a very good link between Guernsey and Alderney. Bergerac is still a fondly remembered TV show set in Jersey, and Guernsey has featured in crime fiction more than once - I mentioned Eileen Dewhurst's book yesterday, and back in the Golden Age, John Ferguson had some success with Death Comes to Perigord, But I'm not aware of any crime story set on Alderney - I'd love to learn about any that do exist - and I'm tempted to fill the gap myself. The skipper of the Bumblebee gave me a number of valuable insights, and I must say the local people are extremely friendly - not criminal types at all - but this tranquil island would still make a great background for a mystery. I liked very much the small museum, run by the Alderney Society, the rocks covered in gannets, and the quiet beauty of the landscape. The island was abandoned by the locals during the war, and they were only able to return to their homes after the German occupation ended. This gave rise to some poignant stories, well told in the museum. The CWA conference in Guernsey over the week-end was, quite simply, one of the best conferences I've ever attended. The event was superbly organised by Jason Monaghan, with assistance from Judith Rhodes, and as I am a fan of the Channel Islands, I managed to expand the trip into a short holiday that also included some literary research. I'd visited Guernsey on day trips previously, but I'd never stayed on the island before. It's a great place, and the weather was generally kind, making it possible to enjoy fantastic scenery as well as a host of interesting events. Before the conference began, I'd visited history-packed Castle Cornet, and had lunch at the beach cafe in lovely Fermain Bay, as well as exploring the cliff path walks complete with a dazzling bluebell wood. Jason is both a crime writer and director of the Guernsey Museum, and the Museum was the setting for a pre-conference panel featuring Keith Miles, Kate Ellis and me. The Museum is both modern and very good, and is situated in Candie Gardens, the setting for Eileen Dewhurst's excellent novel Death in Candie Gardens, which I hope to cover in this blog before long. Close at hand is the Victoria Tower, and if you borrow the key from the Museum, a climb up inside is rewarded by views across the island. I fitted in other trips before and after the conference began - to Fort Grey, with a shipwreck museum, Cobo Bay with another beach cafe, and a fantastic sculpture park in sub-tropical gardens at Sausmarez Manor. All these were destinations I can recommend to anyone who fancies a trip to Guernsey. Sunday's talks came from a retired expert on insurance scams, and from Lilo Picornell, a leading light in the field of forensic linguistics - a subject that will, I'm sure, soon feature in a good many crime novels. As she made clear, forensic linguistic evidence isn't enough in itself to convict someone, but it could have an important role in terms of corroboration. After that, Jason had organised a trip to more notable Guernsey sights - the Little Chapel, the eerie German underground hospital tunnels, and a museum focused on the Occupation. Reading the German propaganda in the war-time newspapers was very thought-provoking indeed. The suffering inflicted on the islanders was quite dreadful. They must have been terrified about what the future would hold. I know that some people wonder if there is still a role for the annual CWA conference, now that we have a variety of terrific crime conventions, including Crimefest, Harrogate and St Hilda's. I'm very firmly of the view that a members' organisation such as the CWA not only needs and deserves a first rate conference of its own, but that it fulfils a very different function from the fan-oriented conventions. The social side is an important aspect, common to all these events, but the CWA conference offers a great deal in addition to members - not just a few jaunts, enjoyable though these are, but expert information of real professional value and a chance to make new contacts. Thanks to Jason and Judith, the members who went to Guernsey were treated to a conference they will long remember, and value. In Bruges is a 2008 film written and directed by Martin McDonagh that is hard to categorise. Is it a gangster movie or a black comedy or both? I suppose I'd describe it as a dark fairy tale - much is made of the fairy tale quality of the Belgian city in which it's set, and there's a dream-like quality about the final scenes in particular which account for much of its appeal. It's often funny, if usually in a macabre way, and its looping storyline keeps you interested from start to finish. Two hit men (Colin Farrell and Brendan Gleeson) are sent packing to Bruges at Christmas time by their boss Harry (Ralph Fiennes) after Farrell messes up his first big job. He's been paid to shoot a priest but also manages to kill a young boy by mistake. This vein of incompetence in the characters' actions runs throughout the narrative. This is a story about violent men who actually are not very bright. But they are also rounded characters, and Farrell and his mentor Gleeson in particular have some redeeming qualities. Much of the humour comes from the fact that Farrell can't stand Bruges. The only snag is that Bruges is such a lovely place (the film makes this clear, and I know it's the case from having visited it a couple of times) that some of the jokes seem slightly forced. But this is a minor quibble, and the atmosphere of the city, plus the occasional references to another film about a canal city, the wonderful Don't Look Now, make for a visual feast. Clemence Poesy plays the drug dealing girl who catches Farrell's eye, and the equally appealing Thekla Reuten makes the most of a small part as the pregnant co-owner of the hotel where the hit men are staying, waiting for instructions from Harry. When the instructions come, a sequence of very unfortunate events is...er....triggered. I really did enjoy this film. It's very well acted, with good background music and great photography. It deserves its high reputation. Today's book from the past is not, in the conventional sense, a crime novel, but it was written by one of Britains' most notable crime writers of the past fifty years, and ranks as one of his most intriguing achievements. The author in question is H.R.F. Keating, and the book is A Long Walk to Wimbledon, which I read in the form of an ebook produced by Bloomsbury. This is a dystopian novel, written in 1978 and portraying a London of the future when rioting has left the city in a semi-ruined and largely lawless state. Mark, the protagonist, receives a message telling him that his wife (from whom he has long been estranged) is dying, and he determines to see her one last time .The trouble is that he lives in Highgate, and she lives in Wimbledon, and the only way to get there is to take his life into his hands and walk through the city. Along the way, he encounters a variety of memorable characters, including a philosophical Indian, and Mad Meg, whom he finds hanging out in Buckingham Palace. There is violence, danger and also temptation as he races (well, walks swiftly) against the clock in order to fulfil his quest. In many ways it's an episodic novel, and much of its appeal lies in the ideas which Keating tosses around as the story progresses. I asked Harry's widow, Sheila, what had prompted him to write a book which was a major departure from his detectives series featuring Inspector Ghote. She told me that the idea sprang from an incident when, near his home in Notting Hill, he was almost struck by a lorry. This sparked his imagination - what if the streets of London often saw vehicles careering around, driven by people under the influence of drugs, when conventional law and order had broken down? It was one of the author's own favourite books, and it certainly shows his range and versatility. As ever with Harry Keating, it's also very readable. I don't often read dystopian or picaresque fiction, but I'm glad I read this one. Close on thirty years ago, a friend of mine and I went to see a play at the Liverpool Playhouse, and the occasion has stuck in my mind ever since. One of the reasons, I'm sorry to admit, is that I've hardly ever been back to the Playhouse since then. Not the Playhouse's fault -it's just that when one is busy working and writing, something has to give, and in my case one of those things has been theatre-and concert- going. At least in the past twelve months I've managed to see three plays, which may not seem much, but is an improvement on previous years. Anyway, the play we went to see was called The Maroon Cortina. It was a modern thriller (at that time) and it was written by Peter Whalley. I've never met him, but he's best known nowadays for having written a good many episodes of Coronation Street. But in those days, he combined play writing with crime novels, and I recall reading and enjoying one of his books at around the same time that I went to see the play. Because I really enjoyed The Maroon Cortina, I thought I'd research it. Apparently, the name of the play was changed to Local Murder - which I find rather less evocative, though I'd have to concede that the maroon Cortina did not have a massive role in the story. I finally tracked down a copy of the script, and I've just read it - rolling back the years, in a strange kind of way. To be honest, the play - realistic in style, and concerning the murder of a young woman - strikes me as very much of its time. What was topical and highly engaging then is not quite so gripping now. And of course, reading a play is a very different experience from watching it - though I've always enjoyed reading plays, I must add. I found this one competently written, and worth reading, but it wasn't quite as excellent as memory suggested. An example of a play that works better, as intended, on the stage than on the page. There's no doubt that Peter Whalley is an accomplished writer, and I hope he returns to crime novels one of these days. Cheshire is blessed with countless remarkable gardens, so rich in beauty, history and variety that it's hard to think of anywhere that competes, Cumbria and Cornwall perhaps excepted..I've visited very many of them, yet thanks to that fantastic charity the National Gardens Scheme, I keep discovering more. Over Easter, I explored one of the very best, and it was packed with literary associations. This was at Poulton Hall in Poulton Lancelyn, Wirral, which has been home to the same family for over nine hundred (yes, 900...) years, and which boasts a quite stunning Storyteller's Garden. Tailor-made to appeal to me, and appeal to me it certainly did. You enter this enchanted place through a wardrobe built into a wall (see the photo above), pushing through the fur coats hanging inside as you go. Brilliant! There couldn't be anywhere more appropriate for a Storyteller's Garden, either, since Roger Lancelyn Green, former owner of the Hall, was famous for his work in writing for children. I remember quite vividly reading his tales of the Knights of the Round Table when I was very young. He was associated with C.S. Lewis and the Inklings, which makes that wardrobe into a wonderful world especially appropriate. As if that were not enough, Roger's son Richard found fame as the world's leading expert on Sherlock Holmes. Unfortunately, I didn't know either man. Roger died in the 80s and Richard, tragically, just over ten years ago at the age of 50. Richard, a couple of whose excellent books are in my own tiny collection of Sherlockiana, was also the premier collector of material related to the great detective, and bequeathed this to the city of Portsmouth. I know from talking to Sherlockians how much he was admired in their circle. He was exceptionally knowledgable, and I wish I'd had the chance to talk to him about Sherlock. As you can see from this small selection of photos, the Storyteller's Garden and its many decorations and sculptures focus largely on themes (Alice in Wonderland, Excalibur,nursery rhymes, pirates, the fire-breathing Jabberwocky, and many more) related to children's literature, in honour of Roger Lancelyn Gren, but not exclusively so. Among the other features of note is a marvellous carved Storyteller's chair, which features (among other things) Sherlock himself. I was lucky enough to visit Poulton Hall gardens on a sunny April day, and it's a visit that I'll long remember. I enjoyed my first John Buxton Hilton book, The Anathema Stone, and so decided to take advantage of the fact that Bello have reissued the Simon Kenworthy series in ebooks by trying another with a title I found inviting - The Sunset Law. In the earlier book, Kenworthy solves a mystery while on holiday in Derbyshire. This time, guess what? He's on holiday again - having retired from the Yard - although now he ventures futher afield, going with his wife to visit their daughter and her American husband, who happens to be a cop. Holiday mysteries are a staple of the genre. They have been popular with writers, as well as readers, for a very long time. "The Adventure of the Devil's Foot", for instance, is a mystery in which Conan Doyle took Sherlock off on holiday. Agatha Christie was forever doing it with Poirot, in great books ranging from Peril at End House to Murder on the Orient Express, and even allowed Miss Marple a slightly unlikely trip to the Caribbean. On a less exalted level, I've never written Harry Devlin or Hannah Scarlett books set on holiday, but holidays do feature in some of my non-series short stories, and holidays I've taken have often inspired short stories - examples include "Sunset City" (the Isle of Man) and "The Bookbinder's Apprentice" (Venice) as well as the very recent "A Glimpse of Hell" (Grand Cayman.) I am currently working on another travel story-related project. So I was favourably disposed towards The Sunset Law from the start. Th e holiday idea gives one a chance to see Kenworthy in an unfamiliar setting - Florida - and the set-up crackles with potential conflict. The son-in-law's behaviour seems rather odd, and events soon take a grim turn as it appears that he may have been breaking the rules. Whose side should Kenworthy be on? Hilton writes well, and his stories have more depth than many crime novels. I suspect he'd have been an interesting person to get to know - sadly, he died nearly thirty years ago. Unfortunately, the story here failed to hold my interest. The impression I gained towards the end (where the pace picks up nicely, I should add) was that Hilton had enjoyed visiting Florida, but had struggled to work out a suitable mystery to set there. He might have done better to content himself with a short story The Sunset Law is a decent read, but I preferred The Anathema Stone. I'm pleased to announce the publication this month by Severn House of the latest anthology of the Crime Writers' Association, Guilty Parties. I've been editing the CWA anthology since the mid-Nineties, and it's always a joy to receive so many original stories. The only downside is that not all of the stories I enjoy can be included, for reasons of space, and that was especially the case this year, when I was flooded with submissions that were very varied and entertaining. The book contains an intro from me, a short foreword by Alison Joseph, chair of the CWA, and author bios, but the meat, of course, is in the stories themselves. Because several entries were very short, I did manage to find space for more stories than usual - 24 in all. And they are all brand new. My own entry, "A Glimpse of Hell", was inspired by the wonderful time I had last year on the small island of Grand Cayman in the Caribbean. Definitely one of the bonuses from my travels in recent years. There are some very distinguished names on the contributor list. They include Peter Lovesey, doyen of classic detection, and also his son Phil, who is himself a splendid writer and past winner of the CWA Short Story Dagger. Laura Wilson, Aline Templeton and N.J. Cooper are there, and so too John Harvey - creator of Charlie Resnick- Christopher Fowler, and Paul Johnston. There are also writers from overseas, including Ragnar Jonasson. Among the other contributors are Chrissie Poulson (whose thoughtful blog is always worth reading), Frances Brody, Kate Rhodes and Chris Simms. 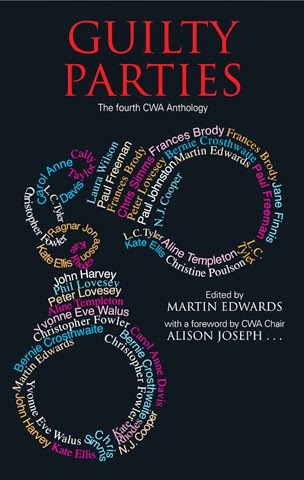 Different readers will have different preferences among the stories, and regular readers of CWA anthologies will note that a number of the contributors, including some relative newcomers to the genre, have never before featured in the anthology. In choosing stories, my criteria include variety, which I do think is an important aspect of a book like this. As far as I'm concerned, it's both a pleasure and a privilege to have had the chance to put Guilty Parties together. John Ruskin must have been one of Victorian Britain's most fascinating men. An eccentric, perhaps, but blessed with many gifts. I enjoyed referencing his work in The Arsenic Labyrinth, and on Saturday, I saw for myself what he described as "the gateway to paradise" - the view from Muncaster Castle, just outside Ravenglass. Muncaster is a terrific place, and I was lucky enough to bump into and have a chat with the owner, Patrick-Gordon-Duff-Pennington, who at the age of 84 was quietly doing a bit of pruning far from the madding crowd (a crowd which on Saturday included a wedding party, the inhabitants of the owl sanctuary and more than a dozen herons, whose feeding time was a memorable free-for-all which attracted a couple of marauding buzzards.) Mr Pennington is a published poet, and I'm quite sure he finds his home surroundings inspirational. Here are just a few of the herons. Muncaster is said to be one of Britain's most haunted castles, and though I'm not sure whether it fits in to my current storyline, it might prompt an idea for a ghost story or two. Not far away are several intriguing villages, ranging from Newbiggin, close to the M.O.D. firing range (warning notices tell visitors to beware of "strange objects" found on the beach - the mind boggles....) to Gosforth, with its ancient cross in the churchyard, and Eskdale Green, where I chanced upon a Japanese garden that the Forestry Commission is, thanks to volunteer work, reclaming more than sixty years after it was abandoned and became overgrown. A magical place, and very accessible. Through talking to a number of people over the week-end, I felt I got a better handle on the way of life led in western Cumbria. I suppose many might ask whether all this research is necessary. Will it result in a better book, or is it really just an excuse for a trip to a lovely part of the world? Well, I am firmly of the view that, so far as possible, research for a book should be a pleasurable experience. While researching The Cipher Garden, for instance, I was kindly offered the chance to go sky-diving along with an expert in the field, but that wasn't my idea of fun, so I declined with thanks. There are definite limits to how far I'm wiling to go in the quest for authenticity! But I do think it helps to see the setting for one's book at the right time of year. I have set several scenes of the new story in Ravenglass and its vicinity in April, and I wanted to see the village at the right time of year. Thanks in no small part to Neil of the Rosegarth Guest House, I got more out of the week-end than I'd bargained for, as he drew my attention to two particular locations not too far away which may well feature, not in the book I'm writing at present, but in a later Lake District Mystery. In the meantime, I came home having had plenty to savour and having gained insights which will, I hope, strengthen my work-in-progress. I'm certainly very motivated about the project,and feeling more optimistic about it than is often the case at the half-way stage of writing a novel. Time well spent in literary as well as feelgood terms, I like to think.